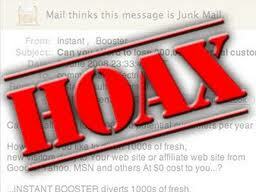 [Viral Hoax] ATTENTION FRIENDS! HACKERS ARE DOING DAMAGE AGAIN ON FACEBOOK! Apparently someone has found another way to hurt and offend people for no reason. Here is a heads up for everyone. There is a new hack on FB. It includes a hurtful phrase coming from you. It is usually very dirty and appears that you have written it. You will NOT see it, but your friends will. This creates many misunderstandings. So to all of my contacts. If anything shocking, inappropriate, or indecent ever appears on my timeline, Please know it did NOT come from me. They can also take your pics. You may wish to copy this to your wall. Thanks. IMPORTANT NOTICE FOR ALL !!!!!!!!!!!! Watch out for your wall! Tell a friend! Hackers are now on Facebook and on the walls of your friends they write insults under your name and that you do not know.You will not see it , but your friends see that your name is written below the written insults. If you get something from me offensive, know that it was not me! THE HACKERS ALREADY ENTERED IN FACEBOOK THEY ARE PUTTING PORNOGRAPHIC VIDEOS TO YOUR NAME IN THE WALLS OR PROFILES OF YOUR FRIENDS WITHOUT YOU KNOWING IT. YOU DON´T SEE IT, BUT OTHER PEOPLE CAN SEE IT, AS IF THESE WERE A PUBLICATION THAT YOU MADE! SO IF YOU RECEIVE SOMETHING FROM ME, IT’S NOT MINE! copy this in your wall. It is for the security of YOUR OWN IMAGE! It is true that hackers are doing damage again on Facebook. And it is true that a hacker could post a pornographic movie link or video on your profile once they gain control of your account (they could post anything for that matter). The claim that other people can see the posts, but the fact that they are invisible to the posting account doesn’t ring true. We have yet to see this behavior in action for ourselves. The alert goes on to mention an ambigous statement regarding comments posted on behalf of the user. We have seen several rogue applications that post bogus links and scam messages as status updates, comments, tagged photos, via Facebook chat etc. Basically, most any method of communication or interaction on Facebook can be exploited by the scammers. In our opinion, the warning is too vague and doesn’t contain much useful information. Copying and pasting general alerts like this doesn’t really help anyone, and it can be rather annoying to see your Newsfeed littered with them. Always spend a few minutes and check the facts before passing warnings along to your friends.